I have something to admit...I still have some Christmas shopping to do! I know, I know, I am normally so good with being organised at this time of year. We have pretty much completed shopping for our daughter, but as always we leave each other last minute, so many family and friends have been asking what I would like, but if I am honest I have not been feeling inspired. However, hopefully now that the little lady has finished nursery we can finally catch our breath and become inspired with another gift guide. Opening our stockings has always been one of my favourite things about Christmas. As a children we would always jump into my parents room first thing and open them. Even at the age I am, I still love to open a stocking. 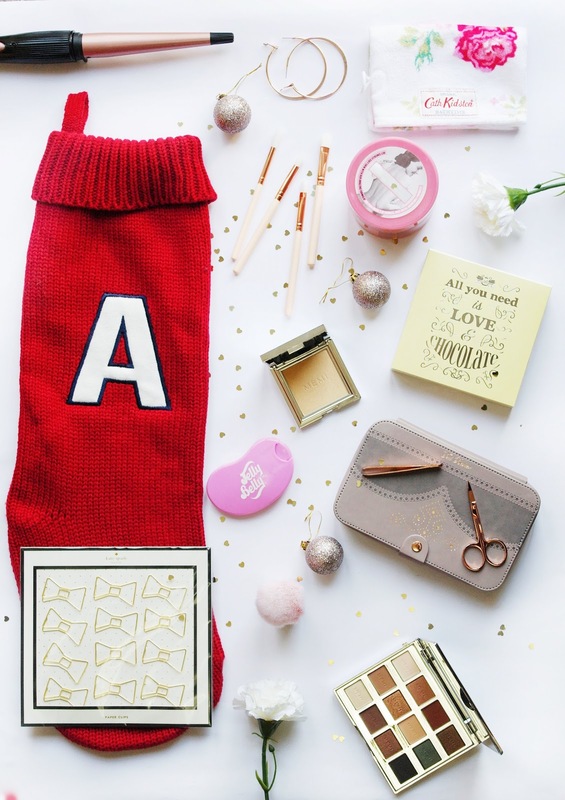 What's in your perfect stocking? For me it would have to include chocolate, candy canes, sweets, stationary, beauty products, nail polishes, socks and anything that is Rose Gold. I have pretty much been gift guide mad this month, so, I will regretfully tell you all that this will probably be my last gift guide this year. *sobs* so let's get started with these stocking fillers. First, we have some beauty picks for you. Have you ever heard of MEMI? There is nothing like a beautiful premium product to make a girl feel special, so MEMI have made it their mission to create an extensive range of luxury, affordable products for real girls who want to look naturally pulled together. Last week, I was kindly send over their Millenial Eye-shadow Palette that has twelve pigment rich matte and shimmer finish shadows, the ultra blendable formulas that will sure to elevate your eyes in an instant. Another product that I was so excited to try was the MEMI Radiance Highlighter in Lemon Drops, seriously in love with that colour. This highlighter has iridescent pearl pigments and light reflecting particles leaving an instant luminous glow. Now before we go, we can't mention some budget friendly makeup brushes can we? I have so many brushes. I have Spectrum, Real Techniques, Zoeva and a couple from The Body Shop. But when I am away I prefer taking budget friendly ones and I have found the perfect ones, they will also be great for flatlays too. Keeping with the beauty theme there are a couple of other products that I had to add into this stocking filler gift guide. The first up is this Ted Baker Brogue Manicure Set - Thistle* which is so so cute. This elegant set is perfect for placing in an everyday bag or whilst travelling, contained within a dainty case. The interior reveals an iconic floral lining and a selection of rose gold tools to prep nails, including emery boards, scissors, clippers and a mirror. A great gift idea for the beauty enthusiast, team with matching gifts available separately to complete the look. I have been a fan of soap and glory products for ages if you get the chance to try this body butter, try it. It’s AMAZING!! The name itself describes how it is, it really is like butter. The smell of this cream is absolutely amazing. It will leave your skin feels smoother, softer and fresher. I normally use it after i had a shower so it absorbs better but anytime should be fine. Unlike other moisturisers out there this one is not heavy at all and is really light and delicate on skin. I think that this soft & fluffy wash mitt by Cath Kidston* that features the pretty pink Antique Rose Bouquet design on a white background and is made from 100% cotton velour is also a great stocking filler to add into the gift guide and seeing as with Christmas many families travel, so this would be perfect to add into a travel bag. One of my favourite sweet brands in the world is Jelly Belly, even my husband is obsessed. Every year for Christmas I always get him a big tub and so when these came through the post, you can imagine my excitement. The Jelly Belly Hand Santizers* are the perfect addition to a stocking. Mad Beauty was inspired by the shape to mould an exclusive container for moisturising hand sanitizers and use a Jelly Belly fragrance. I was lucky to be able to try all three bubble-gum, cherry and blueberry. Being a lover of stationary I would only be too pleased to receive these adorable Kate Spade Bow Tie Paper Clips* in my stocking so if you want to add a touch of elegance to her work space get her these Bow paper clips from Kate Spade New York. A set of 12 paperclips, they are gold in colour and come presented in a sophisticated black & cream gift box. This gorgeous Glam & Style Conical Wand* in Rose Gold and Black is something for the eyes. If you didn't know, Rose Gold is a bit of a thing right now, with many asking for Rose Gold hues in their make-up, hair colour bedroom décor and now styling tools. This fast heating wand is simple to use and has great results. I have thick long hair, and I only had to hold each section of hair for a few seconds to get a nice loose wave in my hair - If you want a tighter curl then just hold a few seconds longer. The heat protective glove is good to prevent burns, as this does reach 180 degree heat in a short space of time. But what makes this even better, is that it's budget friendly. Perfect stocking filler. Keeping with the Rose Gold theme, these Rose Gold Hoops are simple, great value but make a statement. So add these into her stocking. What is Christmas without a small mention of chocolate, but it means so much more when it's extra indulgent. Beech's Fine Chocolate* has an amazing selection this year. I'm so obsessed with truffles, so I am more than sure that there is something for everyone on their website, you can choose from Champagne, Anglesey Sea Salted Caramel, Pink Champagne, Prosecco and so much more. You could also add in some chocolate coins, candy canes and not forgetting a small satsuma. What products would you add into your stocking? 9 comments on "Gift Guide: Stocking Stuffers"
I absolutely love a stocking too! It’s my favourite thing about Christmas, still at this age I ask my mum to make me one every year! It’s so lovely because it’s filled with cute little gifts you wouldn’t usually treat yourself too! Wow that highlighter sounds lovely! I would love to see swatches! I have never really done stockings before, but next year i think im going to.I am in love with your Photography! I love your picks! I’m not doing stockings this year for my boy but there are so many good things to pick up!